I’ve been planning to post these Chocolate Snickerdoodles- a fun remake of a classic favorite; but I also really wanted to make some yummy fall treats . 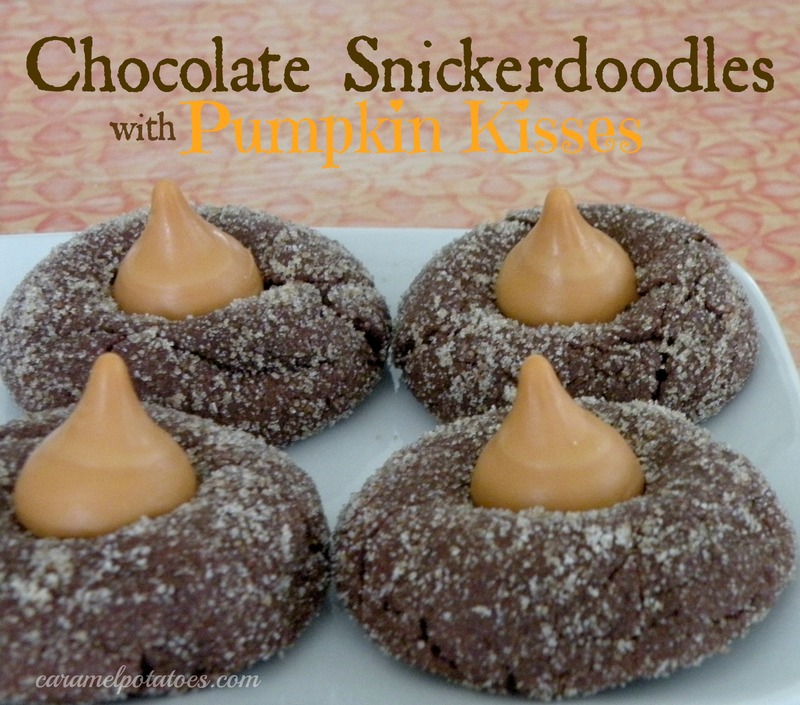 . . then I had this brainstorm to make these into a fall cookie by adding the Pumpkin Spice Kiss. I wasn’t quite sure if the flavors would match – but they did! So here you have it- Chocolate Snickerdoodles all decked out for fall. Actually the pumpkin spice goes really well with the chocolate, but you can make them with or without the kisses- either way, you’ll love them! Preheat the oven to 325 degrees. Line a baking sheet with parchment paper. In a small bowl mix together the Cinnamon Sugar and set aside. Combine the flour, cocoa powder, cream of tartar, baking soda and salt together and set aside. In mixer, cream butter and sugar until fluffy. Add the eggs one at a time. Stir in the vanilla. With the mixer on low speed, add the dry ingredients until just combined. Using your hands, form the dough into 1 inch balls and then roll in Cinnamon Sugar mixture. Place the dough balls on the baking sheets. Bake at 325 for 10-12 minutes or until just firm but not overcooked. While the cookies are baking unwrap your Pumpkin Kisses. I’ve never had chocolate snicker doodles! Oh, I can’t wait to try this! I love the pumpkin kiss! These look so good-going to make them this weekend! I really want to try these. Can’t wait to try these- look delicious. I love the pumpkin kisses – I wait for them every year!!! My husband loves snickerdoodles! I’ll have to try this chocolate version! Thanks for this. I’m in love with the pumpkin kisses, they’re major addicting. OMW!!! These look AMAZING! I am following you via FB, Pin, & Twit now and I pinned this! I’ve got to try it! !